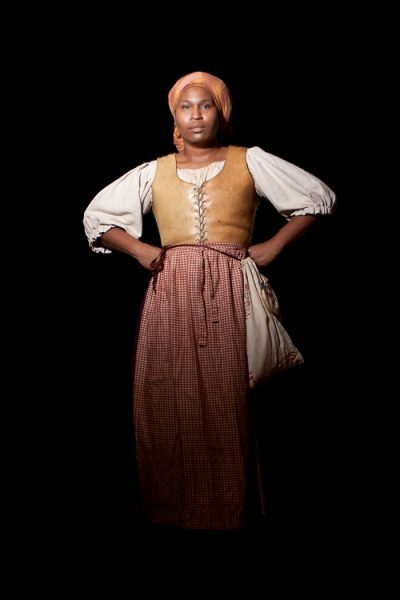 Shemika Berry as Cate Sharper, an enslaved woman from Accokeek, MD, in “Ms. Story’s Living History”. Photo Courtesy of Shemika Berry. Shemika Berry, a former Air Force officer, is a WATCH award winning makeup artist, a WATCH award nominated actress, a costumer, and historical interpreter. She has performed on the local stage for over 10 years. Her most notable performances have been “A Raisin in the Sun” (Greenbelt Arts Center), “August: Osage County” (Tantallon Community Players in Fort Washington) , “A Midsummer Night’s Dream” (Port Tobacco Players in La Plata), “Motherhood Outloud” (Vagabond Players in Baltimore), “Doubt: A Parable” (Newtowne Players in Lexington Park) and “Fences” (The College of Southern Maryland in La Plata). She is currently a board member at Black Box Theatre in Indian Head where she has co-directed children’s theatre camps. In addition to being named the new Interpretation Coordinator at The National Colonial Farm in Accokeek, MD she also serves as an adjunct professor for Theatre Makeup and Costuming at The College of Southern Maryland in La Plata. Shemika Berry is currently acting in “Ms. Story’s Living History”, a one-woman show being performed Feb 1-3 at Indian Head Black Box Theatre. For more information, and to purchase tickets, please click here. Did you always know you’d be doing living history as your profession, or did you want to be something else as a child? I did not know that living history was a profession when I was a child. I always wanted to be an actress from a very young age. I loved watching historically based TV shows and movies for the costumes and the hairstyles. When I was in the 3rd grade I was assigned a book report and I chose “Little House on the Prairie” because it was one of my favorite TV shows. When we were given the task to give a presentation in class, the first question I asked my teacher was if we could dress up as the character from the book. When I was given the assignment in the 4th grade to do a report and presentation on a historical figure for Black History Month, I chose Shirley Chisholm and again asked the teacher if I could dress up like the person I was doing the report on. Finally, in the 8th grade, I was given a similar assignment and I chose Phillis Wheatley. Again I asked if I could dress up as the historical figure, each time I made the request I was given permission from the teacher to dress up. I’m so thankful for my mother who made each costume without complaint; I get my costuming ability from her. So, even though I did not know that living history was a profession I could pursue, the desire to dress up and tell the stories of historical figures in first person narrative has been a part of me since I was 8 years old. I started doing historical interpretation when my son was in Kindergarten. I told his teacher that I was willing to dress up as a historical figure and tell their story in first person narrative if she was interested. She was excited at the idea and contacted me later that month to do a special presentation. She had me back almost every year and the word spread to the other classes and grades. For over 12 years I have gone to various schools and libraries to interpret historical figures. I started telling the stories of the women on the Black History Month posters but found that the children knew those stories by heart. So I decided to expand my repertoire. I started looking up women who were not on the posters, women who weren’t often talked about, or women whose stories weren’t told properly. Now I am the Interpretation Coordinator for the National Colonial Farm in Accokeek, Maryland, where I also portray a woman named Cate Sharper who lived and was enslaved in the area. What has been the most difficult part of bringing “Ms. Story’s Living History” to life? The most difficult part of bringing “Ms. Story’s Living History” to life is finding a separate voice for each historical figure and bringing their personality to the forefront of the story. The purpose is to embody their character and tell their story as they would tell it. That means finding different vocal characteristics and ways of moving/gesturing; all the facets that make a person an individual. I need to embrace those differences so the audience sees each character as a separate person. How have the women you have portrayed/currently portray impacted your life? The women I have portrayed often have a component of their life that I can identify with. Once I can find that common bond, it is easier for me to understand what they may have felt in different circumstances of their lives. Then, I can draw on those similarities to tell their story honestly and realistically. A few years ago, I portrayed an enslaved woman named Elcie on the Sotterley Plantation in St. Mary’s county. We were portraying the choice the slaves were given during the War of 1812. At the end of the tour, a 16-year-old African American young lady asked me why I would choose to portray a slave. I told the audience that, while there are ugly parts of this Nation’s history, we owe our ancestors the respect they deserve. They lived! They had families, feelings, hopes and dreams like we do today. We cannot sweep them under the rug as if they did not exist because they were not treated like people. Telling their stories honors their legacy. Saying their names acknowledges their presence, their contributions to history and to our lives. We are the descendants of those who survived. Not everyone survived the Middle Passage. Not everyone survived slavery. Those who lived had children who had children who are our great-great grandparents. We would not be here if they had not survived and that is why I try to honor their lives by telling their stories honestly and with compassion and love. These women in history that I portray have helped me appreciate the life that I have and given me the motivation to press forward to educate those who will listen and want to learn. Why did you decide to put on a one-woman show? I’ve had a number of friends, parents and family members say they wish they could see my historical interpretations because I most often perform them at schools. I wanted to give those adults who were interested in seeing living history the opportunity to experience what the students have been experiencing. I also want to one day create a children’s program designed around living history. This show is a starting point for those goals. If this show is successful and embraced by audiences, it will show me there is a desire for a program like this and that everyone can be touched by living history. Do you have a dream role you’d like to portray on stage? If so, who, and why? My dream role would be Angelica Schuyler from “Hamilton.” The impact “Hamilton” has had on the country, the theatrical community and most importantly students in schools is exactly what I want to do with Ms. Story and my living history portrayals. Angelica is a strong character who loves her family, is outspoken and has a fantastic costume that I hope to recreate one day. I have always loved musicals since I was a child and merging living history with a full theatrical production would be a dream come true.